2.5 liters tin of extra virgin olive oil from Royal variety "Pico cabins". Denomination of Origin Sierra de Cazorla. Esncia de nevadillo. 12 X 500 ml. Extra Virgin Olive Oil Esencia de Nevadillo. Box of 12 bottles of 500 ml.Picual variety. Esncia de nevadillo. 12 X 250 ml. Extra Virgin Olive Oil Esencia de Nevadillo. Box of 12 bottles of 250 ml.Picual variety. Extra Virgin Olive Oil Esencia de Nevadillo. Box of 3 bottels o f 5 liitersPicual variety. Extra Virgin Olive Oil Esencia de Nevadillo. Box of 12 bottles of a liter.Picual variety. Terra Andúyar. 12 x 250 ml glass bottles. 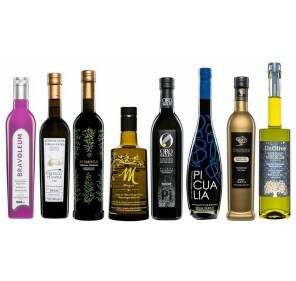 Extra Virgin Olive Oil Gourmet Terra Andúyar. Early harvest. 12 x 250 ml bottles. Picual variety. 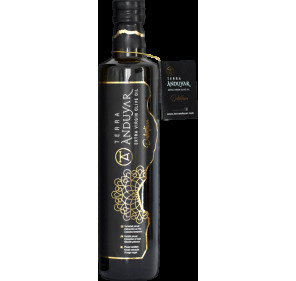 Extra Virgin Olive Oil Gourmet Terra Andúyar. early harvest. 500 ml bottle. Picual variety.